Wow this takes me back. Just jumped back on this site on a whim. Sold my 1997 2.2l OHV Cavalier in 2003 but I attended the 2001 J-Body Bash in Lordstown OH. I do miss that car, had a 50shot of Nitrous Express on that poor thing. Not sure when I joined the site but it was right around the advent of the internet....LOL. Had to be sometime around 1998. Ha, look at that signature. Sadly I sold the STI after 10yrs of ownership and 32,000 miles. I now have a 2013 Tacoma and a 1983 Jeep Scrambler that I fully restored. Is this an AWD ?? Here is the only pic i have so far. So this is all my old mechanicals and suspension and things and brakes and things. early post...all my things...with nick red body. Maybe this year I will drive it. Hate to say mine was destroyed in late 2008 and parted it out accordingly. Some may remember it and ownership was relinquished to 7 years and 157k miles. From the Cavalier I went to a WS-6 to Hawkeye WRX with a ported VF 43 which I had for almost 8 years and now I own an M3 as a weekend toy and a Fiesta ST as a daily. Needless to say the car bug never left me. I got my Cavalier at 16 and it served me into my early 20’s. I remember being in HS visiting these forums daily dreaming of bigger things. I wish I knew where many of my parts went to. If I recall correctly I bought some, but do not remember which. 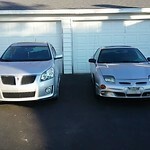 I ended up coming across my former 02 Sunfire GT Coupe for sale on Craig's List at the end of January. I contacted the seller for more pictures and verification. I also ran a CarFax which came back clean and proved it was indeed mine. On Saturday February 4, my parents and I drove 5+ hours and about 250 miles one way to get it. The seller was asking $1500. I offered $1200 and he accepted. When we started the journey back home, the odometer was at 158,902 (when I sold it on 06.07.08, it had 64,644 miles). It's in really decent shape overall considering it will be 15 years old in June. It has some very minor rust and really just needs a deep cleaning and some TLC. The plan is to restore it back to its former glory and than some. I am beyond ecstatic that I have it back where it belongs. I regretted selling it from the moment the buyer pulled out of my driveway back in 2008. It's never going anywhere ever again. I almost forgot this place existed and saw a link on Facebook today so figured I would check it out. I never sold mine, had it since 2001, swapped it in 03 and turbo'd it in 07 and it's still making 600+whp all these years later The video below was take about 5 or 6 weeks ago running our @!#$ting winter 91 octane fuel and meth. Raven, I thought you were selling it on facebook? No one offered...it's still for sale for the right price. I guess I qualify as old school because I take no shortcuts and do it right the first time. 2017 Check in... Joined up 15 years ago hah!. Make the ORG great again!!! Still here too, that Facebook post from last night had me do a check in! I've owned a J since 1998 and I still have the silver cavy that I got back in 03 in the garage. Parked my 2000 Cavalier coupe in May of 2014, since the A/C went out and it gets ridiculously hot here in the summer. Planned on fixing it over the winter, but that didn't happen, I ended up getting a truck, and it sat for 3 years. Wife had a 1999 sedan that she drove the absolute piss out of until the transmission finally took a dump at 237,000 miles and we junked it. We were planning on getting rid of mine too, until I put a new battery and some fresh gas in it and it fired right up like nothing was wrong. Dual Flowmasters sounded just as awesome as I remembered and I knew there was no way I was getting rid of it anymore. I've spent the last few months changing all the fluids, spark plugs, etc., replacing a horribly peeling hood, fender, and bumper, and fixing up the interior (new radio, trim piece, hardwired USB ports, and plastic cover for the usual dash crack). I've still got a few things left to do (replace the headlights, and a bit of paint touch-up on the door trim and c-pillars) but in the meantime I'm driving it with the excuse that I'm saving gas over the truck. Even though it's now 17 years old, with only 136,000 miles on it I think it has a bit of life left.